1. In a medium-sized bowl, whisk together the dry ingredients (flour, sugar, salt, baking soda). Make a hole in the middle of the dry ingredients. 2. Add wet ingredients into the hole and whisk together wet ingredients, until just barely mixed together, leaving it lumpy. 3. Mix the dry ingredients into the wet ingredients just until mixed. Leave it lumpy. 4. Let mixture sit for at least 5 minutes, more if you can. It will almost double in size and bubbles will form from the baking soda reacting with the yogurt (see photo below). 5. Pre-warm a pan on medium-low heat. 6. If you want to add fresh or frozen fruit, let the mixture rise first (step #4), then place the fruit on top of the mixture and carefully fold in the fruit with a spatula. Let it rise a bit longer. 7. Coat the pan with a thin layer of butter. 8. 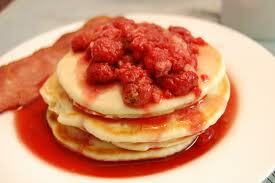 Use a 1/3 c measuring cup to pour pancakes onto pan. 9. 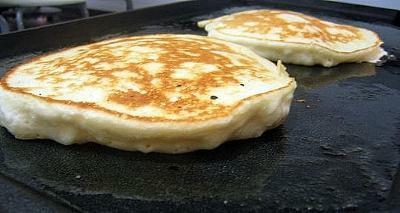 Wait to turn pancakes until they are golden in color on the pan side, and on the upper side they form bubbles. 10. Turn over the pancakes once the bubbles begin to become solidified. The second side will take less than half the cooking time as the first. 11. Serve with a bit of warmed syrup, jam, compote, or something else that strikes your fancy!